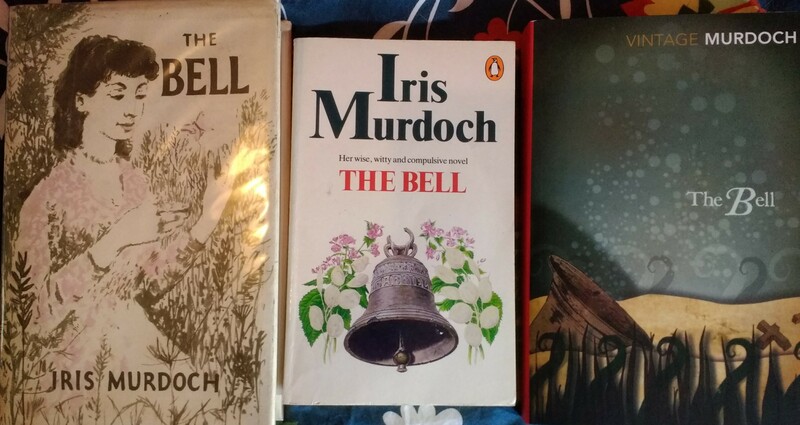 Welcome to the new #IMReadalong update, where we’ll have a quick update on “The Sandcastle” and then move on to “The Bell”, which is probably my most-read Murdoch (which is yours? I’d love to know!). I’ve had some good and interesting comments on my own review of this one (read it and the comments here). I know at least one person who is reading along plans to post a review soon, and as I’ve said, it’s absolutely fine to post reviews and comments after the month in question; it’s helpful if you can let me know about your own blog posts and Goodreads etc. reviews, either by posting a link in the comments on my review here or by linking to my review in yours. Jo has posted an excellent long review on Goodreads (with any spoilers cleverly hidden) and Liz has also posted a review on Goodreads with interesting thoughts on the point of view. Buried in Print reviewed it along with “Under the Net” (read it here), with some great covers. I’ll add more links if any come in in the meantime. If you have comments to make or links to blog posts to post, you can put them here or (better still) on the review. 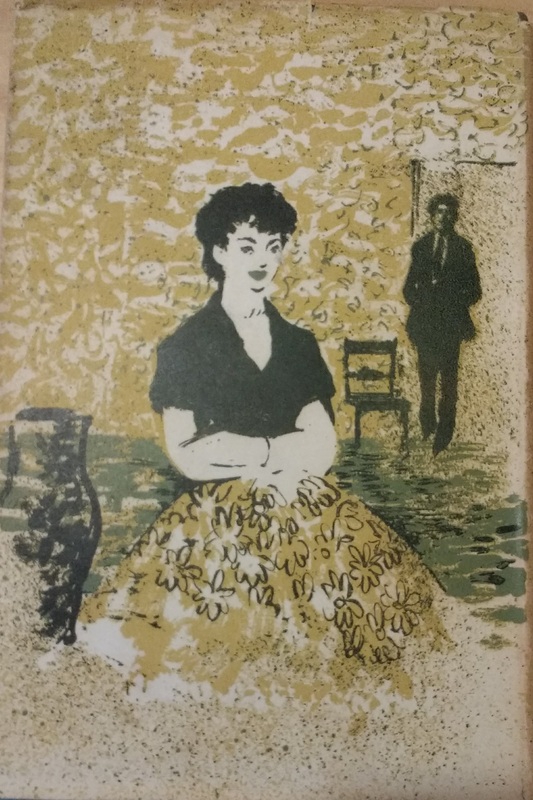 As well as my lovely first edition with this adorable back cover, I have three paperback copies of “The Sandcastle”, seen below. If you have any covers to share of these or any others of the novels, do pop them over via Twitter, Facebook or email (find contact details for email on the Contact Me page). 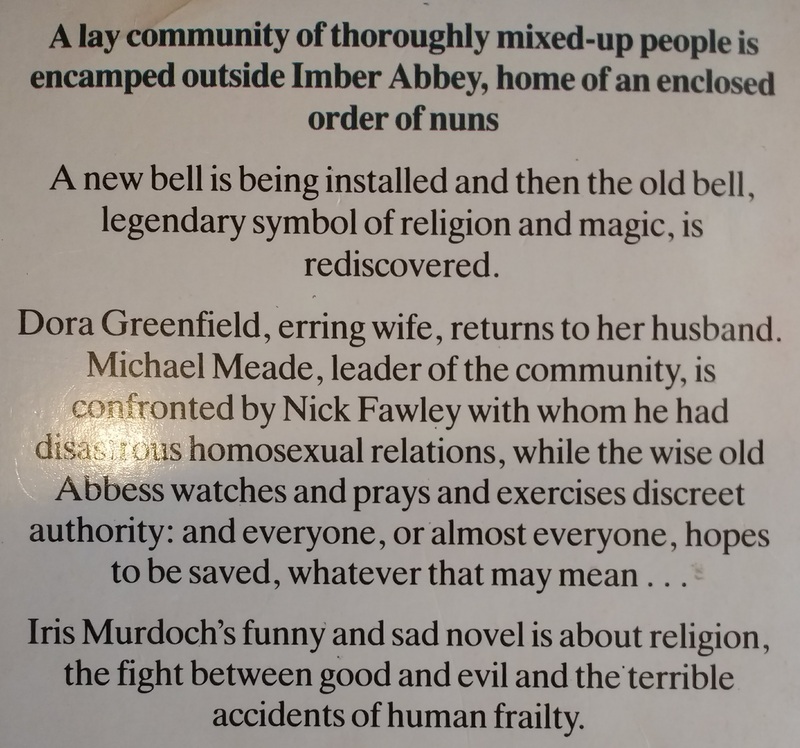 The reason “The Bell” is my most-read Murdoch is because I did my research on Iris Murdoch and Book Groups on it. You can read about that project and see a copy of the book I wrote here. Is it actually thrilling? Hm, not sure. But it’s a good read and I hope a few of you are ready to carry on through the oeuvre with me. Are you up for it? I’ve got a bumper package of reviews today – back to the two-book review for one day only, as I’ve had a bit of a break so got to do some more reading (hooray), and also please pop and have a read of my review of the slightly behemothic but entirely necessary autobiography by Gordon Brown, “My Life, Our Times”, which I’ve reviewed for the ever-lovely Shiny New Books: more here. Now, two books about islands, and they’re both predominantly blue, too! One is off my TBR: it had been on my wishlist for ages and was picked up last year, and the other was one I gave to my husband for his birthday before last, as he’s had a couple of trips to the Isles of Scilly. A journey around selected islands of the UK, pinned to Fogle’s apparent need to buy his own island, a plan he refines as he goes along, giving a structure to the separate stories. He puts the islands into groups or themes sometimes, and will then mention others, so our own favourite St Michael’s Mount crops up in the holy islands (so, rather unfortunately, does Caldey, now the centre of a horrible child abuse scandal: this book was written well before that broke and doesn’t feature the implicated people). He visits places large and small, from trying to get to tiny Rockall to spending time on the Isle of Man. It’s all pretty jolly, with a bit of history and Fogle’s trademark posh cheekiness thrown in; it was nice to see him mention his Castaway experience on Taransay and some of his fellow islandmates. His adventures are mixed: he is mixed up with losing a helicopter (though thankfully no lives) and has some hairy moments, as well as getting banned from Shetland’s Up Helly Aa, but it’s a good adventure during which you learn some interesting facts. A useful epilogue brings us more up to date with some of the characters he’s met along the way. It was unfortunate that it was lacking a map, though. The man who brought us “The Village” (a book I enjoyed) and various other British community documentaries passes a bit less than a year but a bit more than a summer on the Isles of Scilly, accompanied by a BBC film crew, although they’re not mentioned apart from the odd “we” after the beginning of the book. It’s very light and gossipy, although paying respect to the tragedies that have occurred and do occur while he’s there, and structured more like a novel or a soap opera than a straight report of the year, with the tragedies being broadly signposted and the details of people’s lives and loves – and finances – being carefully recorded. We meet some interesting and resourceful people and particularly follow the arc of the new parish priest (hence the title), and it gives a varied picture of the different activities on the islands (back in 2007; I note the radio station is still going, which is cheering), but I wouldn’t imagine he was hugely popular on the islands once he’d published it. He’s also a bit rude about birdwatchers … An interesting read, though, and lovely to find out more about some places Matthew has spent time. I’ve temporarily abandoned the Big Books I’m reading (the VR and Olympics ones) and naughtily skipped past Bruce Springsteen to pick off some lighter and BookCrossing ones, the latter so I can shore up our BookCrossing Zones with less work. So prepare yourselves for – shockingly – some out-of-order reading! This one, though, was bought along with “Spectacles” and can be seen in the latest TBR pic, near the front! Helen has a hectic life being a journalist in London, seeing her husband for a few minutes each evening before falling into an exhausted sleep. They’re also trying for a baby, and that’s not happening. But she has her mum nearby, a great group of friends, a social life and all the vibrant capital has to offer. Can she swap all this for a year in Denmark – and not even Copenhagen but seaside, empty Jutland, where the new foodie revolution has certainly not hit and most of her neighbours are retired? When her husband gets offered a job at Lego HQ, she gets the chance to find out – and write a book about it. Going freelance and with a more flexible life, Helen decides to concentrate her research on the “World’s Happiest Country” tag Denmark has apparently earned. The book is well-structured, funny and honest. The chapters go through their experience month by month, but then also concentrate on a topic, for example food, sexism, education or taxation, as well as asking experts from that field how happy they are. Of course, Helen also talks about her neighbours and the friends she makes as they settle in. We follow their attempts to join clubs, learn the language and not break too many rules (there are many rules) in this engaging and fun but realistic and very readable book. I also enjoyed the bits of Danish included and their similarities to Icelandic, including the words for tax and teddy bear! A very enjoyable addition to the expat/immigrant experience literature. Do you like reading about people’s experiences in new countries? What do you recommend? I didn’t watch Late and Light Lunch for some reason, but have been aware of Sue, half of Mel and Sue, for their work on Bake Off, and Sue herself for panel show stuff, etc. I thought her book would be self-deprecating and funny, maybe a bit silly. What’s very good is that it takes us right up to date; none of this just getting us up to the juicy fame years then expecting us to buy the next volume. Hooray for that! It was, though, a very curious mixture of extremely silly and obviously completely invented for comic effect and deeply affecting and emotional sections on her dad, her dogs, etc. This gave a bit of an uneven ride, as it sometimes slammed from one to the other, however she does spend quite a lot of time explaining how her dad escapes from too much emotion by recording the weather etc and her mum by catastrophising, whereas she does it with streams of words, so it seems apt and at least she’s being honest and true to herself by being fanciful then emotional. I couldn’t read the farewell letter to her dog myself, but it’s well signposted. We do get early years, the Cambridge times, lovely bits about her friendships, lots of funny stories, Bake Off, Maestro and her later travel documentaries, so it’s all here in an entertaining read. As I mentioned in an earlier post, the Christmas booky onslaught (lovely onslaught, obvs) is followed swiftly by my birthday books. And my lovely friends came up trumps once again. Here we have Alys Fowler’s “Hidden Nature: A Journey of Discovery”, which is about both her life changes and about kayaking the canals of Birmingham (OK, that is something you wouldn’t find me doing in a month of Sundays, but I read books about mountain ultra runs, so …). Then “Reunion in Barsaloi” by Corinne Hofmann is the third in her series about marrying a Masai chap (as you do) and their subsequent life. Jenni Murray’s “A History of Britain in 21 Women” has been read by almost everyone I know, it seems, and I know about the weird referencing but it’s a must-read at the moment, isn’t it. And finally, Sara Marcus’ “Girls to the Front” is a book about the history of the Riot Grrl music genre/movement. I wasn’t a proper riot grrl (was I? not sure) but I loved many of the bands and I can’t wait for this one. What a set of treats right there! I went to the National Running Show on my birthday with some of my running friends and I managed not to find the Bloomsbury Sport stall until the end when they’d sold all their stock, but I did get my copy of Lisa Jackson’s “Your Pace or Mine?” signed and met and chatted to Lisa (eeee!) 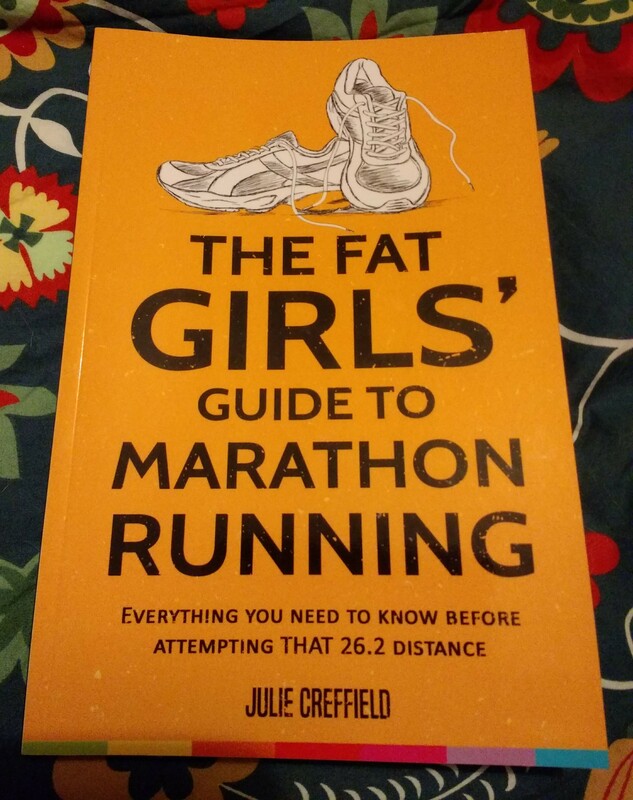 and I bought this one, “The Fat Girls’ Guide to Marathon Running” by Julie Creffield. I wouldn’t consider myself overweight, but I’m no whippet and I really love reading about different people and their different obstacles. Julie came across as lovely and very encouraging, and I thought this would be a positive book with some interesting points and ways to help people I work with as a run leader who might be experiencing some of those obstacles themselves. I’d better admit to some NetGalley wins, too, hadn’t I. I’ve managed to cling on to my 80% reviewed status and badge, although I’m on EXACTLY 80% at the moment. Tina Brown – “The Vanity Fair Diaries 1983-1992” – not sure if I admitted this December win. Looks like a lot of gossipy fun. Published 14 November 2017. Rolf Potts – “Souvenir” – this is entirely my friend Cari’s fault, as she told me about it. How dare she! Tell me about a book she thinks I’d love?? It’s a short (yay) book about souvenirs through the ages and a musing on what we bring back from our travels. Published 08 March 2018. Sophie Green – “The Inaugural Meeting of the Fairvale Ladies Book Club” – a novel about a long-distance book club in the 1970s Northern Territory of Australia. Blame the emails from NetGalley for this one. Published 01 March 2018. Joanna Nadin – “The Queen of Bloody Everything” – Dido, caring for her elderly mother, remembers when she fell in love with a family – a normal family. Published 08 February 2018. 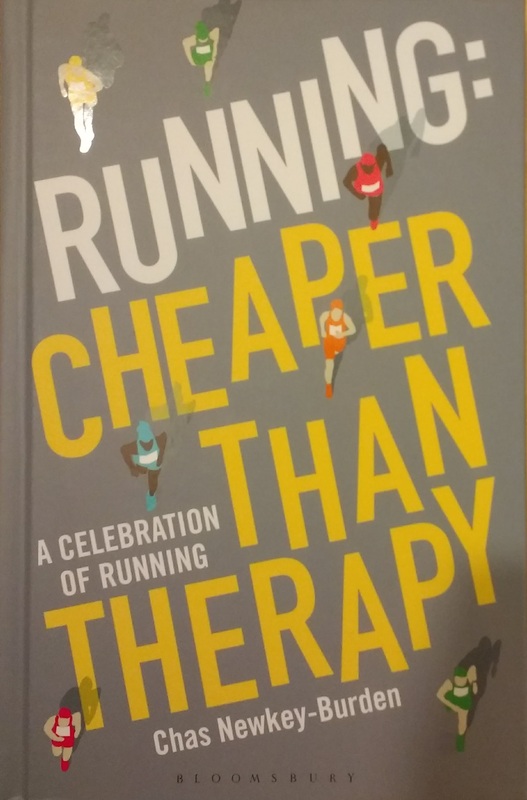 Scott Douglas – “Running is my Therapy” – I can blame book blogger Rebecca for this one, and even though it’s a PDF not a Kindle book it does indeed look right up my street, about how running can help depression and anxiety. Published 17 April 2018. Have you read “Spectacles”? 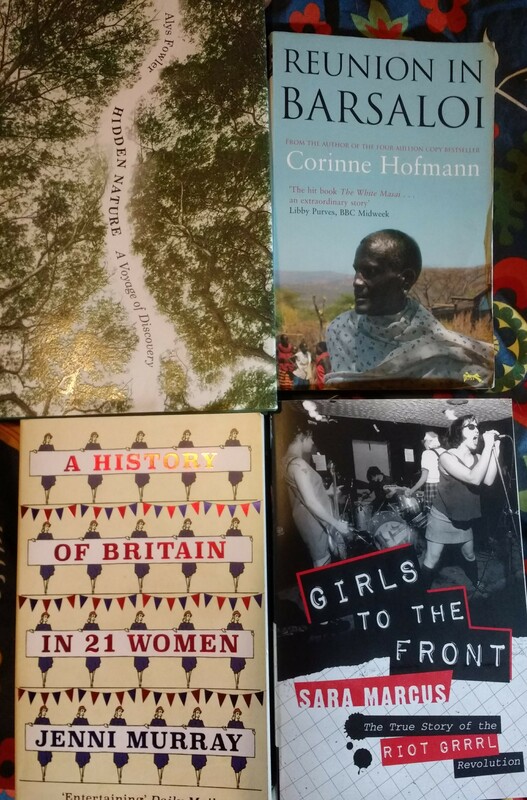 Have you got any of these new acquisitions on your shelves, in your blogs or on your Kindles waiting to be read? I’m conscious that I haven’t blogged on here for a little while – I’ve been nose-in-book but not finished anything to review here yet. So here’s a little update. I have finished a review book just as a review is published; Matthew has read and reviewed a book I enjoyed from last year; and I am making progress with my #IMReadalong. How are you all? What are you up to? I’m a bit behind with reading your blogs, too! One book in for the month so far – I went to WHSmith’s to buy an anniversary card for my cousin and found they had a remaindered books tray. 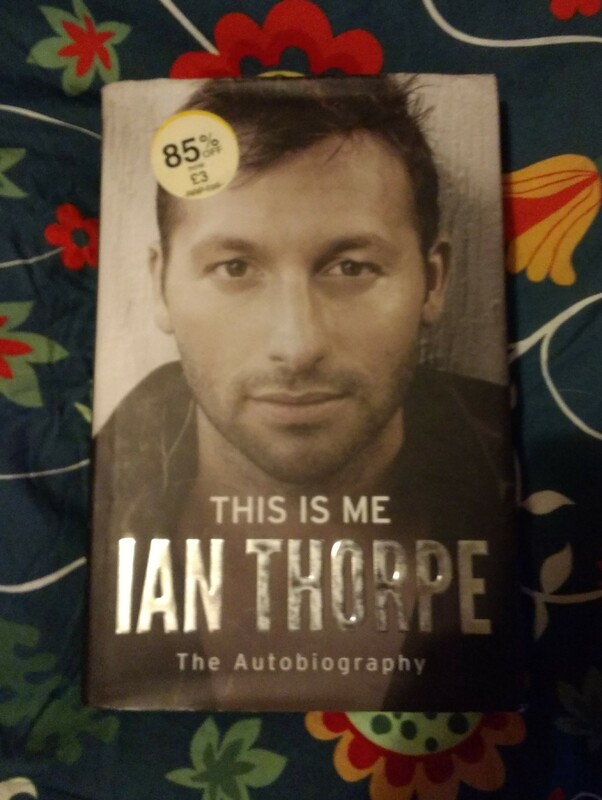 And there was Australian swimmer Ian Thorpe’s autobiography, marked down to £3 because the cover’s a bit battered (I think they might have thought there was a mark on the outside of the text block, however this proved to be the edge of the image they have at the top of each chapter). I do like a sports autobiography so I just couldn’t leave him there! I will remove the sticker from his head! So last night I finished reading Gordon Brown’s autobiography, “My Life, Our Times”, which I will admit has taken me a while to read, as it’s dense and serious with lots of information. But it was really good. I’m reviewing that one for Shiny New Books, so watch out for the review (which I’ll be sending in today) when it’s published. Subtitled “Hitchhiking the Silk Road”, this book by the esteemed traveller and travel writer looks back to an early journey in his 20s, taking the silk route from Europe eastwards. It was a young man’s book but gave a nice chance to look back and revisit some of the places he went in his 20s, and I greatly enjoyed it. Read the full review here. I have very much been enjoying listening to “Happiness for Humans”. I found the story believable, laugh-out-loud funny in places, and gripping. I liked a lot of the exposition on what it is to be human and how the AIs expressed their frustration and wonderment at the human condition. Also the obsession with cheese. The narrator was excellent as well – particularly with the voices of the AIs. It was a little bit too “chicklit” in places and the obsession with “Some Like it Hot” got a bit wearing at times, but overall an enjoyable, clever and innovative story with deeper insight into the human condition than at first meets the eye (and ear). Interestingly, I’d seen the character Jen as resembling Jen from the IT Crowd (just from the name, really) and the narrator gave Ralph the voice and mannerisms of Moss from the same programme. 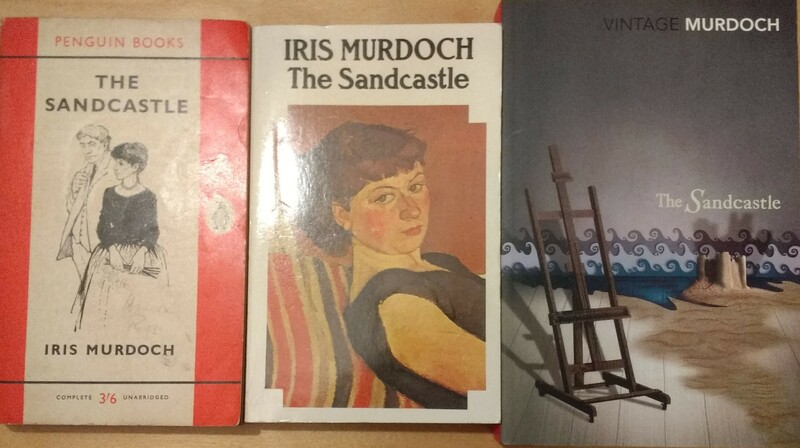 I’m now back reading “The Sandcastle” for my Iris Murdoch readalong. There are lots of passages and scenes I remember well but some I’d forgotten; it’s a good read, though. Coming up, I have another review book for Shiny, “Dawn of the New Everything”, which is about virtual reality, but I think I might go for some light relief in between and pick up Sue Perkins’ autobiography or the book about living Danishly. What are you reading RIGHT NOW? (apart from this blog post)? I read this book – indeed, I BOUGHT this book – because it’s January’s book of the month in the very fun but naughty Runner’s Bookshelf group which my friend Stacey started on Facebook. This is me, the one who received 18 books for Christmas and has a birthday coming up. 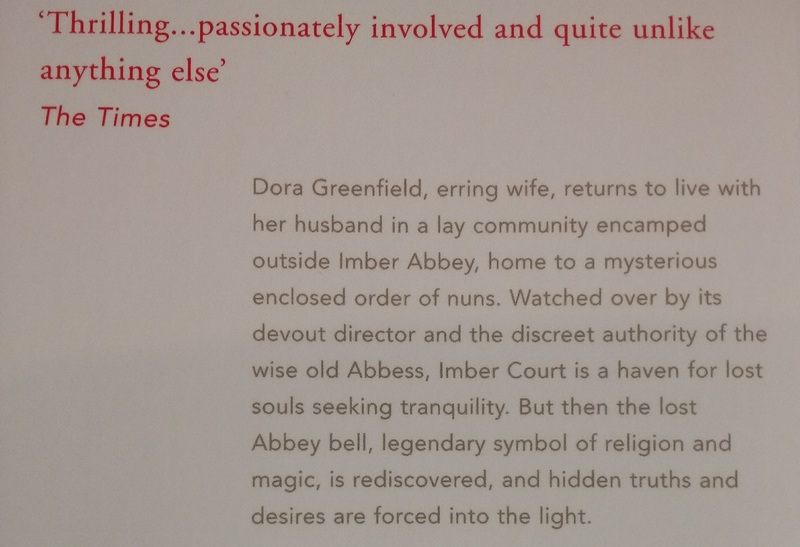 Just shows the power of peer group pressure … and I do like a running book and Bloomsbury do some good ones. Anyway, it’s quite a short book and a quick read, although also a nice hardback edition, which as I say in the review, is a perfect gift for the runner in your life. A fun little book – although as the title suggest, it does highlight the therapeutic benefits of running – with lots f short pieces on revolving themes spread through the book, for example, Runners you Know (from the nutrition-obsessed runner to the surprisingly good elderly person), Running Wisdom and quotes included in Running Philosophy. It also collects various runners, either known for being a runner or for being a celebrity who runs, and looks at their often very powerful running stories. There are also longer pieces on, for instance, 26 Reasons to Run and then very quick laughs with signs people hold up at races – so something for everyone, really. It’s all positive, kindly, parkrun-friendly and nice about the party pack at the back of races (thank you). The 26 Things That Happen When You’re Training for a Marathon was very true (and could only be boosted by 26 things that can happen to derail your marathon, as I try to go for my third one, having avoided falling over a dog and cracking a rib / having a (delayed) operation so far). I also found the fact that this has the up-to-date stories of some of the other writers I’ve read over the years (Paul Tonkinson, Phil Hewitt) but who I’d not kept up with. An ideal gift for the runner in your life, whether they’re a parkrunner or a marathoner, a trail racer or a road runner, a greyhound or a party pack member. Good stuff.